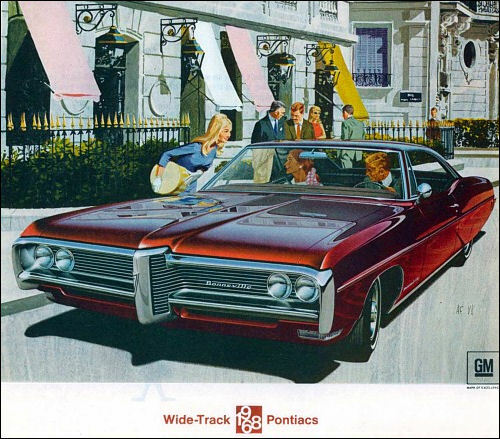 Undoubtedly, when you consider your new Pontiac, you'll see and feel the hundreds of other safety, convenience and performance features that make 1968 the best season yet to go Wide-Tracking. 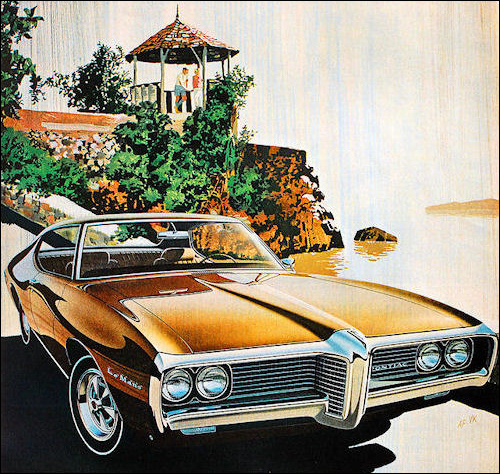 And the easiest year yet to fit a new Pontiac to your own personal taste. You'll find some of these personalizing features listed on the back page. 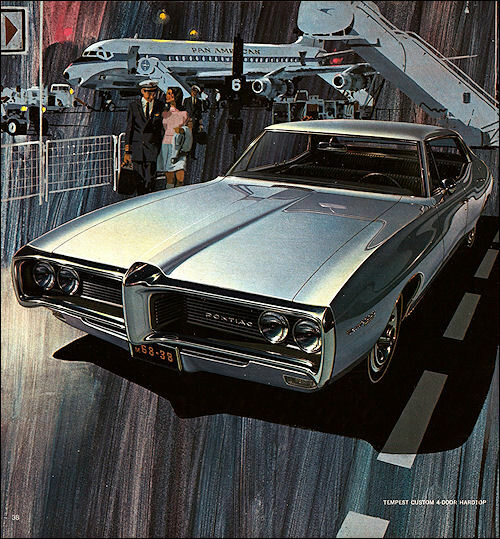 And for your added driving security, the following safety features are standard on all 1968 Pontiacs. But a moment please, before you move on. 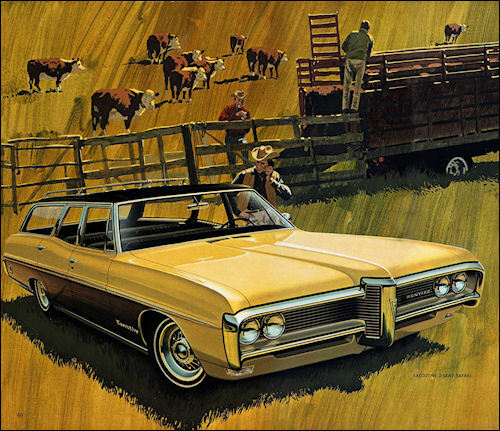 No matter how secure and safe we build our 1968 Pontiacs, it's still up to you to drive them that way. All it takes is a little care, caution and patience. 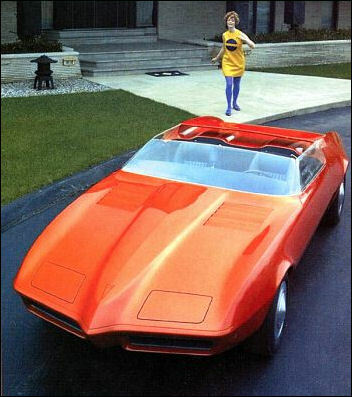 V8 cyl., ohv, 4-bbl, 428 cu.in., comp. 10.75:1, 390 h.p. 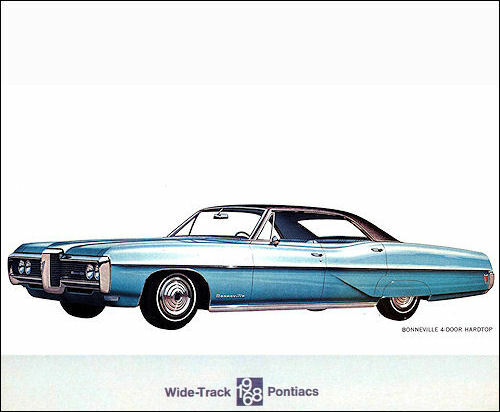 (opt on Catalina, Ventura, Executive, Bonneville and Grand Prix except Station Wagons). If you think Wide Tracking is just a rich man's sport, Tempest Custom proves you're wrong. We do agree it looks deceiving. From the integrated bumper-grille, to the sweeping rear end, Tempest Custom doesn't appear to be a car that easily fits budgets designed for dull, little sixes. Sure, it sports a six. But dull it definitely is not. Our Overhead Cam Six is 250 cubic inches – that's 175 hp, in case you do your evaluating from that sort of thing. And the guy who said inexpensive interiors always look it, never reckoned with our stylists. Now, don't get us wrong. The Tempest Custom isn't as luxurious as some of our other models. But one thing is certain: It won't keep reminding you of how little you paid for it. 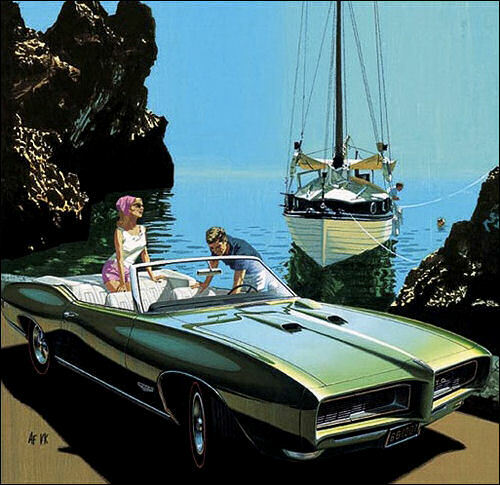 The best way to describe the '68 LeMans is to let you sit back and just look. This is styling born years ahead of its time. Four-doors look like hardtops. Hardtops and Coupés like sports cars. 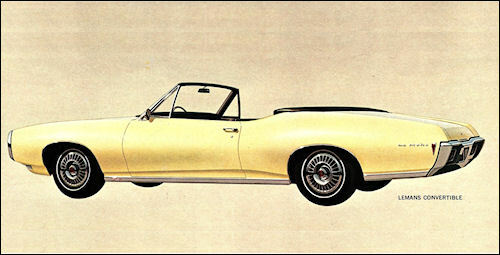 (We've even shortened the Coupé's wheelbase to 112 inches, so it acts even more like a sports car.) Inside, the opulent interiors are a blend of rich, supple fabrics, complemented by a generous supply of simulated walnut grained paneling on the dash (when you order the decor group). Power plants? We've started you off with our Overhead Cam Six, new this year at 250 cubic inches, that delivers 175 hp. 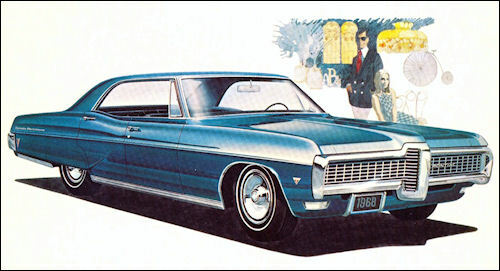 Or you can order a 350cubic-inch V-8 (available in regular- or premium-gas versions). They cost extra, but once behind the wheel, you'll know why. 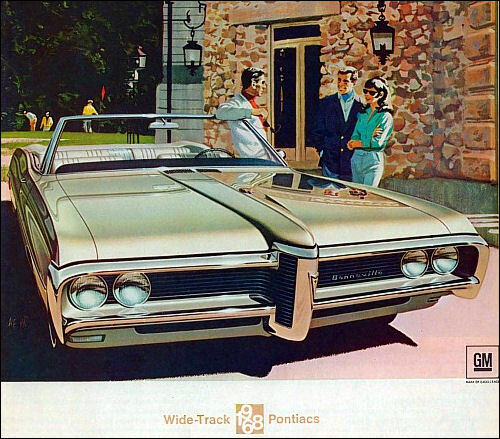 Also new-for LeMans – are Pontiac's famous disappearing wipers (standard equipment). They hide away under the cowl, and only come out when it rains. 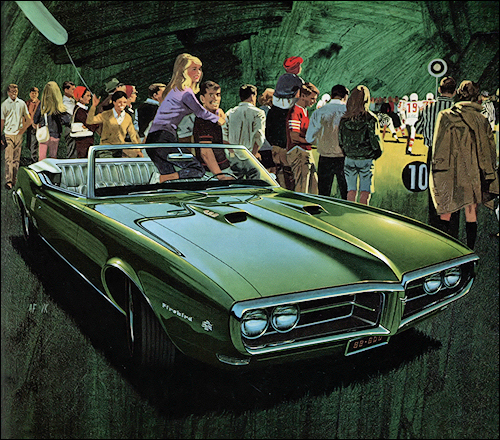 In '68, the Great One again is GTO. Have no doubts. 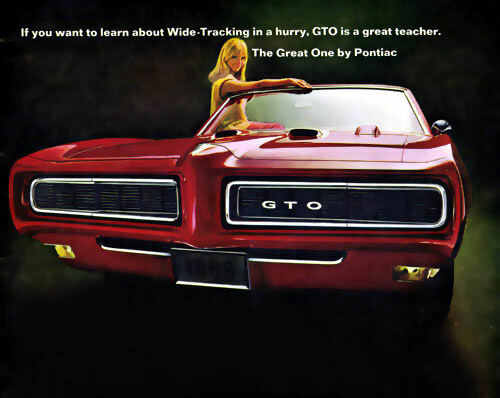 The GTO is first and foremost, a drivers car. One that has spawned many pretenders. The beauty that generates a false placidness is a pleasing coincidence. 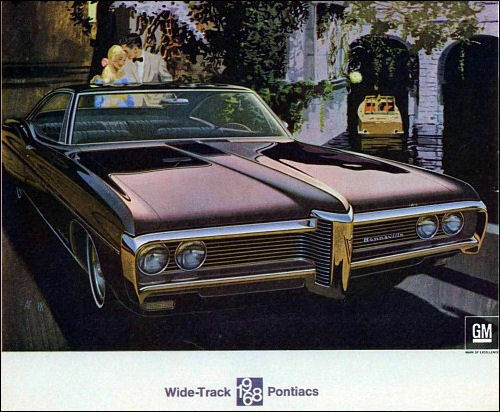 It begins up front with the most fantastic bumper since the invention of the bumper. It's the same color as the car, but won't chip, fade or corrode. The Great One's equally impressive credentials in the world of concrete and asphalt are easily discovered. Just climb behind the wheel, negotiate a few turns, try a few hills and presto! You'll never want to go back to plain ordinary driving. 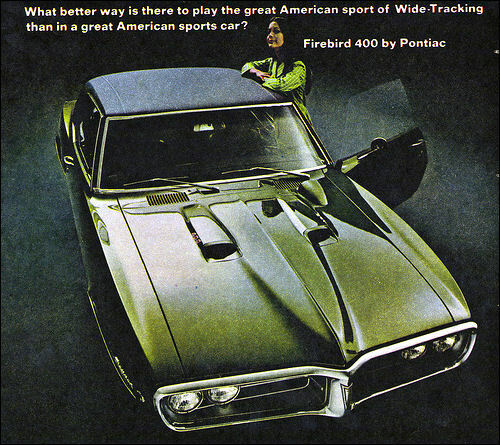 Of course, those are just two of the reasons why we call the GTO The Great One. 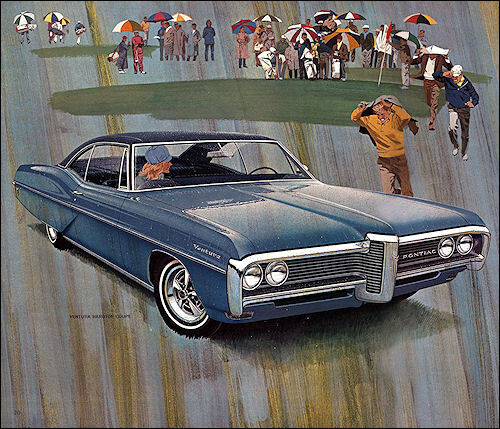 There are others, like our famous disappearing windshield wipers that come as standard equipment. 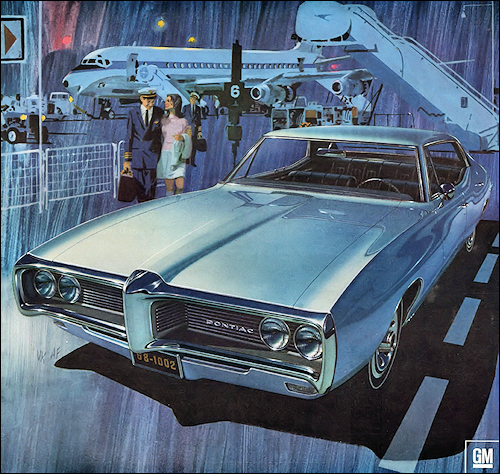 Or you can order disappearing headlights and a 4-speed stick shift – floor-mounted, of course. They cost extra, but are worth every penny. wb: 121 in. V8 cyl. 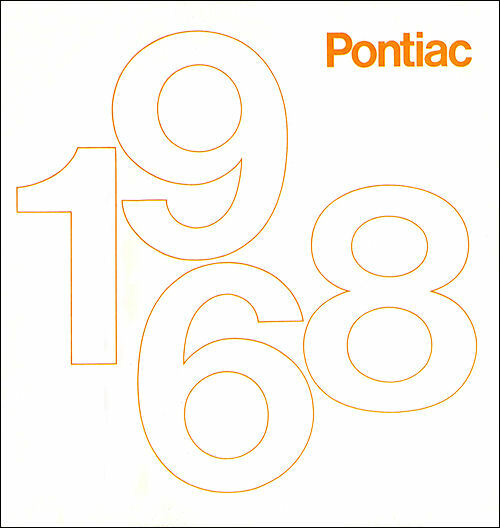 Every year, people try to build a better Catalina than Pontiac does. We do. And we succeeded again. Enticingly. And at as low a price as possible. 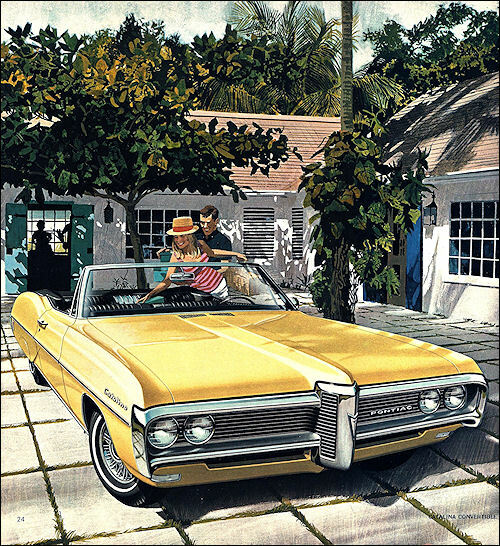 Rest your eyes on that Catalina Convertible for a moment. 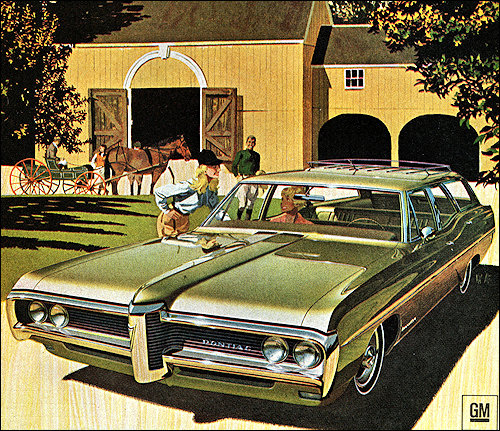 Standard power comes from a 290-hp, 400 cubic-inch V-8 (or the 265-hp, no-extra-cost option that runs on regular gas). 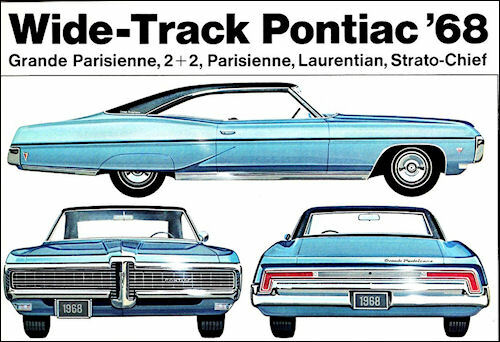 It's engagingly (oh, you noticed) sprung over a 121-inch wheelbase, that handles traffic or semi-deserted cement with equal aplomb ... thanks to no less than Wide-Track. But what Catalina looks like – and feels like – are only beautiful parts of what makes Catalina Catalina. 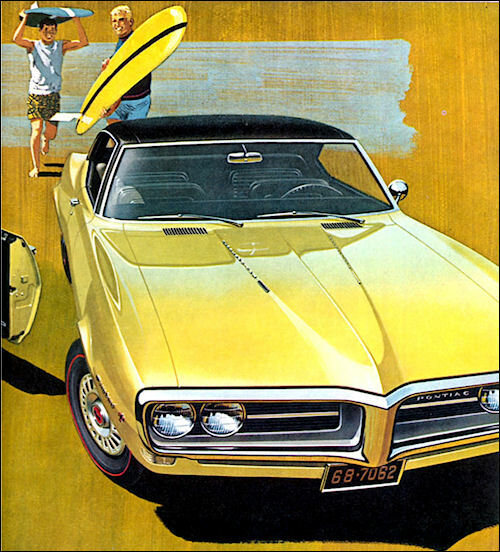 Ventura for 1968, a delicious lesson in money management. 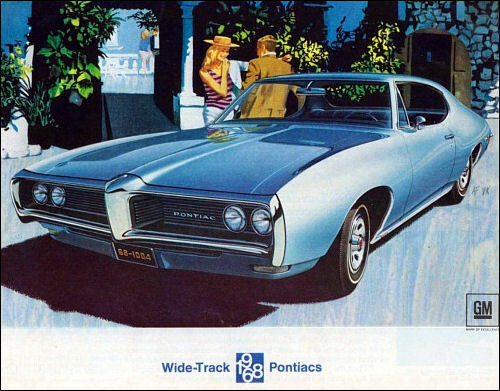 Ventura's rather rakish approach to what constitutes a great car might leave you a little exasperated ... at what you used to be driving. 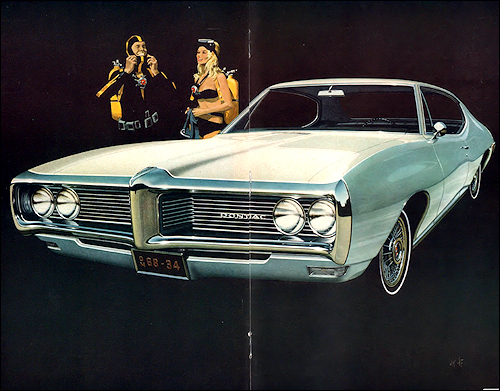 The '68 Ventura is what happened when Pontiac set its mind to building a lavish car on top of a 121-inch wheelbase. 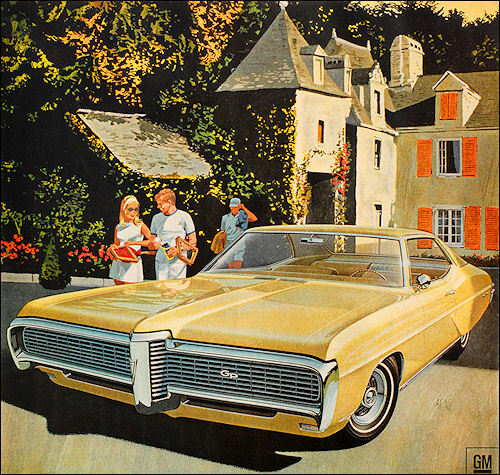 And then charging less for it than you thought a car of its stature could cost. To do it, we set a 400-cu.-in. V-8 that develops 290 hp on top of Wide-Track. And gave you the option of a 265-hp version that runs on regular, and made sure that that economy engine was the only economy showing. 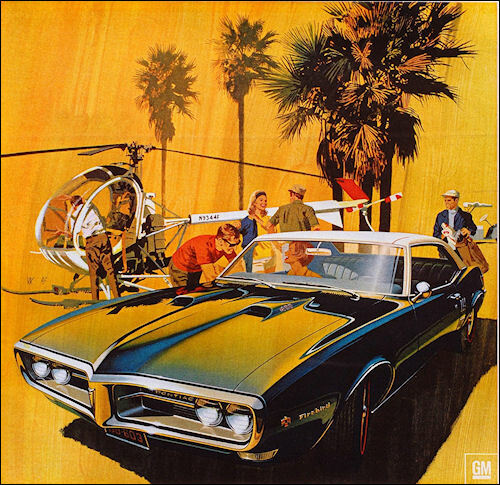 The exuberant luxury that's made Grand Prix America's premier personal luxury car is back. Abundantly. From the solid, road-leveling comfort of its 121-inch wheelbase, to the inimitable way the extra-padded seats ease tension out of you, to the new thoroughbred sweep of its lines, Grand Prix is every bit a generous provider. 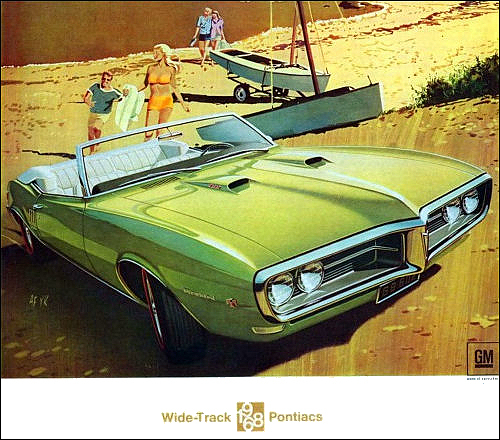 But don't let its elegant hardtop styling lull you into thinking it Walter Mittyish. 350 hp from a 400-cubic-inch V-8, coupled to dual exhausts, give you all the smooth response you need. 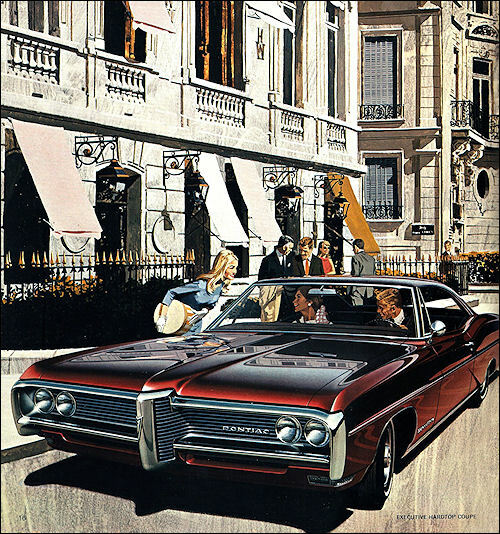 But if you'd care to be just a bit unusual, you can order your Grand Prix with a stick shift and the optional and highly obliging ride-and-handling package. And to guide it all, you can order the responsive touch of variable-ratio power steering. 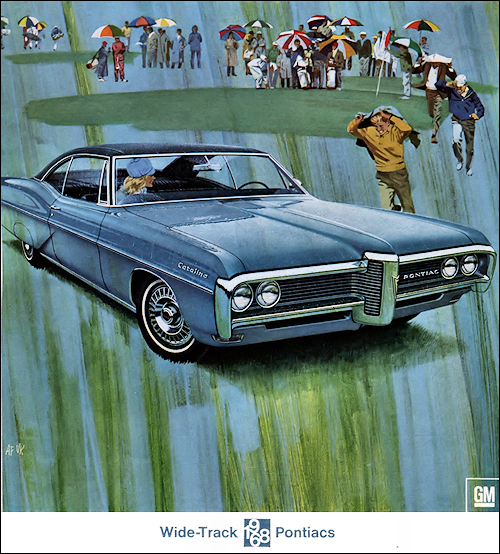 But we did call Grand Prix a luxury car, didn't we? wb: 124 in. V8 cyl. 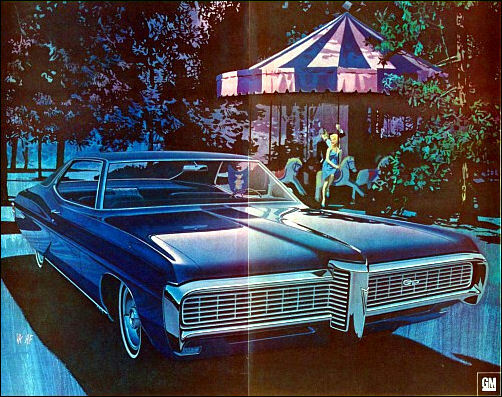 Our 1968 Executive. Luxury continued. More affordable. 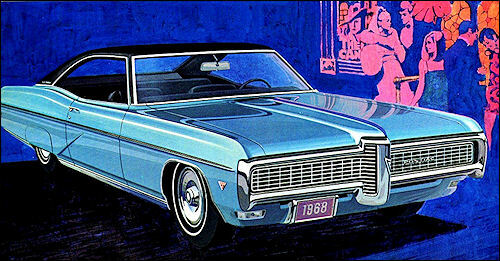 Our 1968 Executive is the master manipulator of two tastes: wealthy and wise. 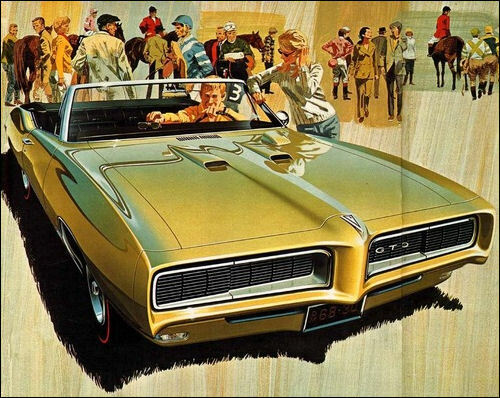 Its standard accoutrements include an electric clock, deluxe steering wheel, deluxe wheel discs, map, courtesy and trunk lamps and walnut wood grain vinyl on the dash. And all at a cost you'll consider outlandishly low for such an automobile. And as soon as you fasten yourself behind that steering wheel, you're in for another surprise. Sprung deftly over a 124-inch wheelbase, our handsome Executive responds amazingly to the touch. 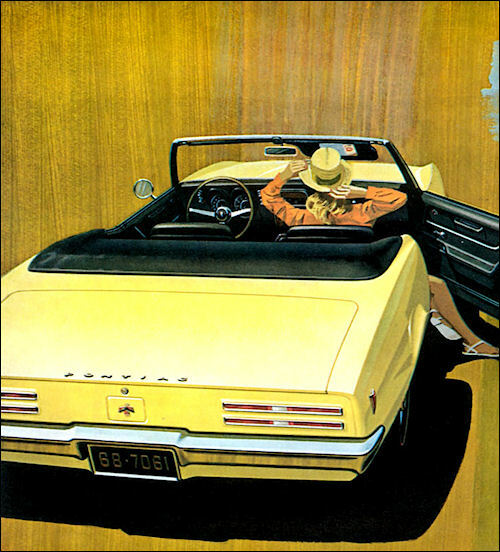 (We admit, the optional variable-ratio power steering does help a bit.) And there's another response you might be interested in. It comes from one of our newer 400-cubic-inch V-8s. But we did mention something about luxury didn't we? 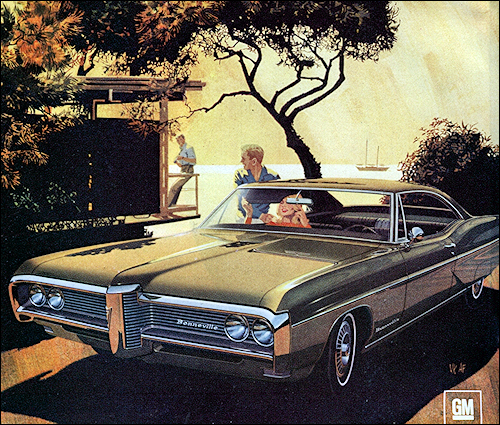 '68 Bonneville – remember where we got the name. The all-too-easy-to-lapse-into verdict about our excitingly styled Bonneville is that the excitement ends as soon as you sidle into the most stylish interiors in the business. That's barely the beginning. Because Bonneville rests on the biggest, smoothest riding wheelbase we make, it handles its grandeur with amazing agility. 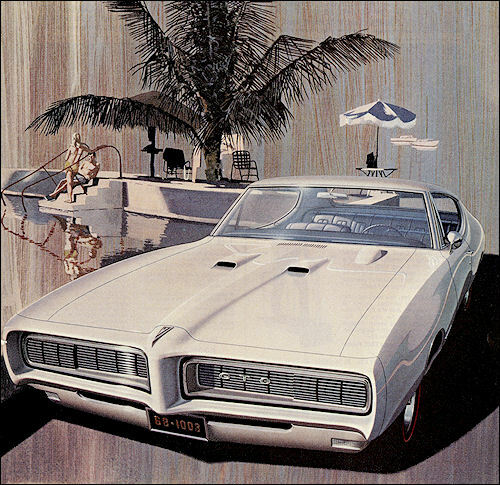 And its 400-cubic-inch, 340-horsepower V-8 is a hint of the mobile stylishness that awaits you underneath. 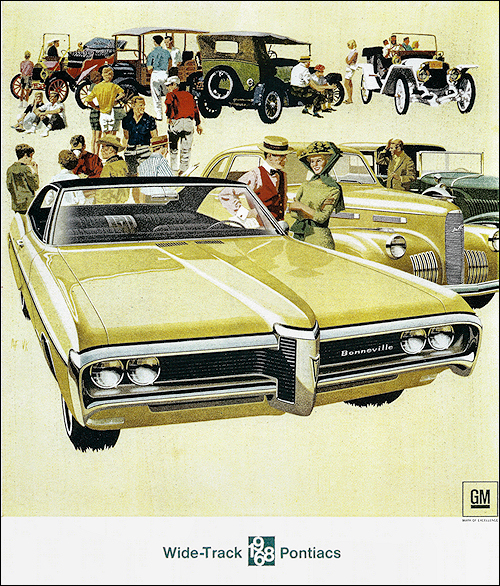 But of course, we didn't sever Bonneville's ties with opulence entirely. 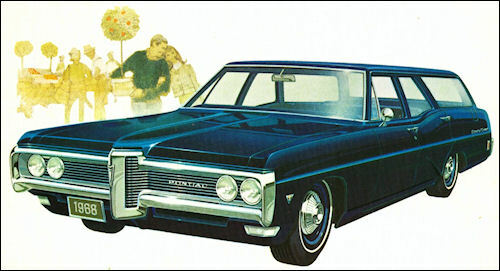 Brougham has become known as one of the country's supreme luxury automobiles. From its unabashed lines to its new 340-hp V-8, our Bonneville Brougham is as much a car to be driven as it is one to be admired. Enhancing its driving accomplishments are such standard features as the exceptional riding comfort you get only when you combine the balanced stability of a 124-inch wheelbase and the road-hugging qualities of Wide-Track. To hone its handling even further, you can add our variable-ratio power steering option. 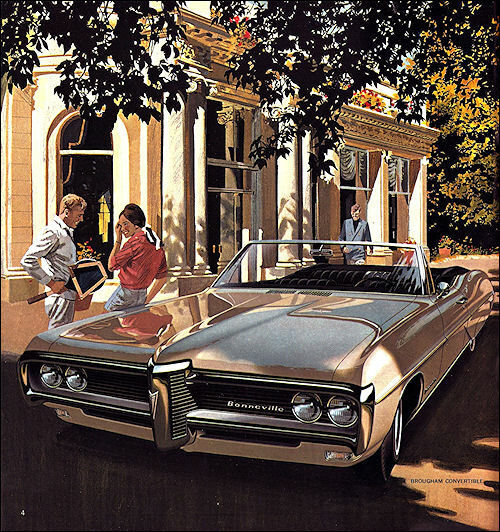 And once you're inside Brougham, all the comfort and luxury that's hinted at outside comes on-elegantly. wb: 108.1 in. R6 cyl.